This page is updated regularly with some of the best selling and highly rated Breadmakers that are currently on offer. These Bread Maker deals sell out fast so make sure you don’t miss out on these bargain prices. Despite being compact, the Russell Hobbs 23620 Breadmaker does not skimp on features. 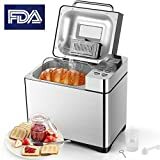 It includes 13 hour delay timer and keep warm function, crust control, a 55 minute fast bake mode, 3 loaf sizes, 12 programs including Gluten-free, and even the ability to make jam! This bread maker is easy-to-clean with non-slip feet to keep it steady and has a clear LCD display. With an RRP of £99.99 this is an affordable breadmaker, and even better value when on it’s on offer. The Homeleade Digital Bread Maker is for professional bakers and those just starting out on the bread baking journey. This bread machine has 19 programmable menus, a delay cooking timer and a keep warm setting. You can bake three sizes of loaf up to 900g, with 3 crust settings. There is also an automatic ingredients dispenser ideal for adding nuts and seeds. Included is a measuring cup and spoon, instruction manual with recipes and a 1 year manufacturer’s warranty for your peace of mind. The Panasonic SD-ZB2502BXC Bread Maker is on the upper scale of breadmaker prices, but it is so highly rated by its buyers that its RRP of £160 is thoroughly justified. 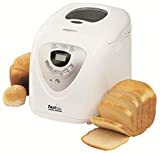 This bread maker can make three different sizes of loaf, has a 13 hour delay timer and features rapid bake functionality. It is very stylish and comes with all you need to bake the perfect loaf at home including a recipe book to get you started. This bread maker also has a speciality mode, yeast and nut dispenser and a 100% Gluten-free program. You also have options for browning level and it has a jam & compote mode so you can make your own bread spreads too! 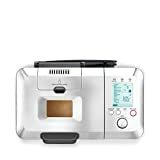 The Tower T11002 Digital Bread Maker with Nut Dispenser has an RRP of £99.99 and with that you get a fully featured bread machine with 17 variable settings, 15 hour programmable timer, delay baking and keep warm modes, and a 3 year guarantee. It also benefits from nuts and seeds dispenser, a viewing window and very importantly a Gluten-free mode. Its stainless steel body is stylish and durable and its pan and kneading blade are non-stick and therefore easy-to-clean. Get it now whilst it’s on special offer! The Morphy Richards 48281 Fastbake Breadmaker has a wealth of features to help you make the perfect loaf at home, and its RRP of £129 is very impressive too! The 12 programs include options for making cakes, loaves, dough and jam, and it also has 3 loaf sizes and 3 crust settings too. The ‘Fastbake’ setting allows you bake a loaf in under 50 minutes and it has a 13 hour delay timer for over night baking. The LCD display is easy to read and the design is very attractive and has a cool touch body. There are also instructions in the supplied manual/recipe book for 100% Gluten-free loaves too. The Cuisinart Convection Bread Maker gives you total control of how you want your loaf to look and taste. You choose the ingredients, the size and browning level of the loaf and the bread machine does everything else. The handy automatic nut and seed dispenser means your seeded loaves are just right. It has a 13 hour auto-start setting timer, keep warm function, 12 pre-set programs, a removable paddle and a handy viewing window. The touch sensitive controls are easy to use and the breadmaker is easy to clean. You can also make jam in it – great news! With an RRP of £150.00 we think this is good value, and even more so when on special offer. 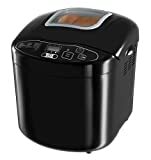 Panasonic are renowned for their excellent bread makers and the Panasonic SD-2500 WXC Automatic Breadmaker with Gluten Free Program continues the tradition, even with a very affordable RRP of £119.95. 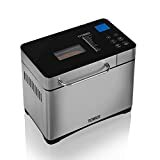 With this bread machine you get ten bread and dough modes, three different loaf sizes, Gluten-free mode, delay timer and crust control feature. You can make jams and compotes in it, and the speciality mode means you can experiment with different grains and flours – no problem! You probably know that everyone has their own particular favourite bread flavours, types and tastes and the Panasonic SD-2500 WXC Automatic Breadmaker has are covered for almost all the options. The stylish Morphy Richards Premium Plus Breadmaker has an RRP of £139.99 and comes with many features and settings. There are 19 settings for all kinds of doughs including breads, pizza doughs, cakes, desserts and jams. There’s a 12 hour timer delay and settings for 4 different types of crust, something to suit everybody’s tastes. There’s also a drop down knife for easy removal and a set of breadmaker recipes included. This premium breadmaker has all types of breads covered and would be an asset to your kitchen.